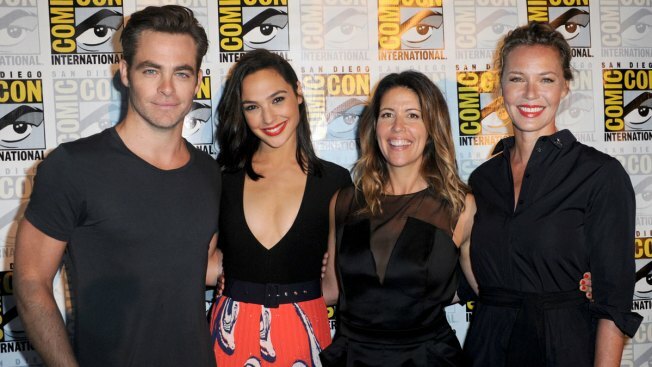 Actors Chris Pine and Gal Gadot, director Patty Jenkins, and actress Connie Nielsen attend the Warner Bros. 'Wonder Woman' Presentation during Comic-Con International 2016 at San Diego Convention Center on July 23, 2016 in San Diego, California. Director Patty Jenkins first expressed interest in making a "Wonder Woman" movie over 10 years ago. She'd just made "Monster," which won Charlize Theron an Oscar, and was doing the rounds at various studios talking about what she'd like to do next. Richard Donner's "Superman" was a film that changed her life, and it occurred to her that there still hadn't been a "Wonder Woman" movie. "Wonder Woman," Jenkins remembers saying. "Let me make 'Wonder Woman.'" It happened, though not without a few detours along the way, including a pregnancy, Jenkins almost directing the sequel to "Thor," and another director initially getting the "Wonder Woman" job. Now Jenkins' "Wonder Woman" is barreling toward its big release on June 2. And unfairly or not, there's a lot at stake. Not only is it the first-ever big screen movie about one of the most popular superheroes of all time, it's also the first female-led superhero movie in over a decade, following the financial disasters of "Catwoman" and "Elektra." On top of all that, it's a rare big budget blockbuster from a director who happens to be a woman. No pressure, right? The story of "Wonder Woman" is a dozen stories tied into one film. It's the story one director who loved "Superman" getting to realize her lifelong dream of directing a classical superhero origin story. It's the story of an industry taking another long-delayed gamble on a female-led film in a historically male-dominated genre. And it's the continuing story of female directors fighting for a place at the blockbuster table. This summer there are a number of female-directed films coming out, but most are independent, few are wide-releases and all are one-offs. Among them are Stella Meghie's teen drama "Everything, Everything" (May 19); Lucia Aniello's bachelorette comedy "Rough Night" (June 16); Sofia Coppola's Civil war pic "The Beguiled" (June 23); and Kathryn Bigelow's 1967 riots drama "Detroit" (Aug. 4). Jenkins has the sole tent-pole, an industry term for a big budget movie intended to support a studio's lower-earning films. In fact, Jenkins is one of the few women who have ever been granted a budget of over $100 million. Bigelow got one for "K-19: The Widowmaker," and Ava DuVernay has one for "A Wrinkle in Time." It's not unreasonable to assume that "Mulan's" Niki Caro and "Captain Marvel" co-director Anna Boden will get that too. But it's a void that's especially notable during the summer, when there are a seemingly endless string of male-directed films with $200 million-plus budgets in theaters each week. It's not that women don't direct summer blockbusters. In the past ten years of top studio summer releases there's been Elizabeth Banks' "Pitch Perfect 2," Phyllida Lloyd's "Mamma Mia" and Anne Fletcher's "The Proposal," all of which grossed from $287.5 million to $609.8 million on budgets under $52 million. They're just often not afforded blockbuster budgets. "When the money is there, there are fewer women," said Melissa Silverstein, publisher and founder of the website Women and Hollywood. Writer, director and actress Zoe Lister-Jones whose indie "Band Aid" also comes out June 2, said she doesn't see the same amount of risk being taken on women as men to handle tent-pole and franchise films. "That should be the focus of where we look at gender inequity in this industry for female directors," she told The Associated Press earlier this year. Experience is a Catch-22 for women. Lucasfilm chief Kathleen Kennedy got into hot water last year when she said that while finding a female director for a "Star Wars" film is a priority, they want to make sure that they're set up for success. "You can't come into them with essentially no experience," Kennedy told Hollywood trade Variety. Jenkins is "as stunned as anybody" that there have been so few — especially because she and many of her female peers regularly handle comparable budgets working in television. "A pilot that you shoot in 9 days for $10 million ends up being a very big parallel to this. It's the same dollar per day," Jenkins said. "So many men have crossed over ... it's the same job, just on a larger scale." "Wonder Woman," Jenkins said, is even on the higher end of superhero pic budgets — not, as many have reported, in the $100 million to $120 million range. Jenkins is well aware of the pressure to succeed, not only for her movie and reputation, but for all female directors. It's part of the reason she walked away from directing "Thor: The Dark World" and why she was especially cautious to take on "Wonder Woman." She needed to be sure that she and the studio, Warner Bros., were on the same page as to what movie they were making. That clarity of vision is what "Catwoman" producer Denise Di Novi said they lacked in 2004. The Halle Berry starrer was a critical and commercial flop, making only $82.1 million worldwide against a $100 million budget. "One of the reasons that movie failed was we were trying to have a female superhero movie be like a male superhero movie. It was too soon," Di Novi said. "We weren't able to really give it the integrity of being one of the first female superhero movies. We were trying to make it like all the other movies. And it shouldn't have been." But that's when the buying power of teenage boys dictated everything. Because of hits like "The Hunger Games," and the diversity (and success) of content being produced by Amazon, Hulu and Netflix, Jenkins thinks things are changing. Even though "Wonder Woman" is only her second feature, Jenkins' work has always been steady. Hollywood has never stopped trying to get her to make films. There are already talks about a "Wonder Woman" sequel, but nothing she can discuss publicly yet. Dwayne Johnson has her on his shortlist to direct the Disney pic "Jungle Cruise," too, although he's not sure she knows that yet. "Patty has that really cool edge ... I felt like she could be a really cool choice for a movie like 'Jungle Cruise'," Johnson said. "Plus, you know what? I'm just a big fan."